Yes, Felix Baumgartner's stratospheric jump was crazy. Like, really crazy and awesome and crazy. And he broke a few records. 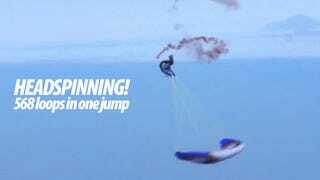 But this new Red Bull jump by Spanish paraglider Horacio Llorens seems crazier than Felix's to me. Watch the video. For each loop I descended about 32 feet (10 meters). I looped for 15 minutes until I felt that I was near the ground and I stopped at 500 meters for safety. I could have done it a little bit more, but my head was aching and I couldn't really see the distance [from the ground]. Welcome to Gizmodo's winter break! We're exploring the crazier side of tech this month, so check out gizmodo.com/core if all you want is straight tech news.